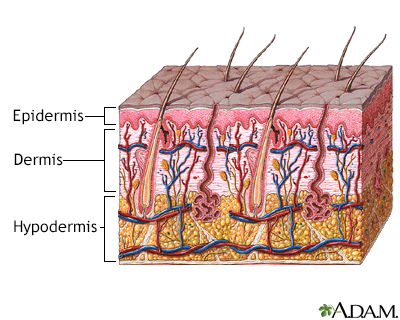 The outermost layer of the skin is called the epidermis. It is only about 20 cells deep, roughly as thick as a sheet of paper. The dermis ranges in thickness from 1 to 4 millimeters (about 1/32 to 1/8 inch). The dermis contains tiny blood and lymph vessels, which increase in number deeper in the skin. Melanocytes. A layer of cells between the epidermis and the dermis called melanocytes produces a brown-black skin pigment (melanin) that determines skin and hair color. Melanin also helps protect against the damaging rays of the sun. When cell proliferation occurs in a controlled and contained manner, the resulting spot is noncancerous (benign) and is commonly referred to as a mole or nevus. 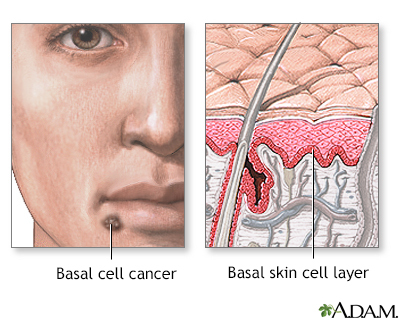 Squamous cell carcinoma in situ (also called Bowen disease) is the earliest form of this type of cancer. The cancer has not invaded surrounding tissue. Cancer areas appear as large reddish patches (often over 1 inch or 2.5 centimeters) that are scaly and crusted. The sun is the most important cause of prematurely aging skin (photoaging) and skin cancers. Oxidation and Antioxidants. UV radiation promotes the production of oxidants, also called free radicals. Free radicals are unstable molecules produced by normal chemical processes in the body that, in excess, can damage the body's cells and even alter the DNA. This contributes to the aging process and sometimes to cancer. Vitamin C is a good antioxidant that helps protect the skin from the damaging free radicals. Defective DNA Repair and Protective Enzymes. Some skin cancers are caused by a breakdown in the body's mechanisms that help repair DNA damage. For example, xeroderma pigmentosum (XP) is a rare genetic disease in which the body cannot repair damage caused by ultraviolet light and affected people get numerous squamous cell carcinomas even at a young age. Normally, a number of enzymes in the skin help protect against this damage. Breakdown of Immune Protection. Specific immune factors protect the skin, including white blood cells called T lymphocytes and specialized skin cells called Langerhans cells. These immune system cells attack developing cancer cells at the very earliest stages. However, certain substances in the skin, particularly a chemical called urocanic acid, can suppress such immune factors when exposed to sunlight. Moles (Nevi) and Other Dark BlemishesCertain moles and dark blemishes increase the risk for skin cancer. Any mole (nevus) or other blemish that seems new, changing, or unusual in any way should be evaluated by a health care professional, because an existing mole can become cancerous. Although 80% of melanoma cases develop from brand new lesions or moles, your risk of developing the condition increases if you have the tendency to develop moles. Freckles. Freckles typically appear in children on sun-exposed areas and are often evenly brown or tan. The more freckles a person develops as a child, the greater the risk for melanoma in adulthood. True freckles will disappear when one is not exposed to sunlight. Dysplastic (or atypical) nevi. About 30% of the population has moles called dysplastic nevi, or atypical moles. They are larger than ordinary moles (most are 5 mm across, about the size of a pencil eraser, or larger), have irregular borders, and are various shades or colors. Individuals who have dysplastic nevi plus a family history of melanoma (a syndrome known as FAMM) are at a high risk of developing melanoma at an early age (younger than 40). The risk for those with atypical moles and no family history of melanoma is less clear. Anyone with atypical moles should be evaluated every 6 to 12 months by a health care professional. Large birthmarks (giant congenital nevi). Very large birthmarks that measure more than 8 inches (20 centimeters) across are major risk factors for melanoma. In such cases, cancer often appears by age 10. Medium-sized congenital nevi do not appear to increase the risk for melanoma. Whenever possible, very large birthmarks should be removed during infancy. Experts disagree about whether small birthmarks need to be removed. Parents should watch any birthmark for changes, even into adulthood. Wear sunscreen. The use of sunscreens is complex, and everyone should understand how and when to use them. Follow instructions closely and reapply as directed after swimming or sweating. The bottom line is not that people should avoid sunscreens or sunblocks, but that they should always use them in combination with other sun-protective measures. UV intensity depends on the angle of the sun, not heat or brightness. The dangers are greater closer to the start of summer. Organic formulas contain UV-filtering chemicals such as octocrylene, octyl salicylate, homosalate, and octyl methoxycinnamate (blocks UVB), avobenzone-Parsol 1789 (blocks UVA), cinoxate, ethylhexyl p-methoxycinnamate (blocks UVB and small amounts of UVA), oxybenzone, and benzophenone-3 (blocks UVA/UVB). Look for a wide-spectrum sunscreen that contains combinations of these ingredients and filters both UVA and UVB light. Inorganic formulas contain the UV-blocking pigments zinc oxide or titanium dioxide. Zinc and titanium oxides lie on top of the skin and are not absorbed. They prevent nearly all UVA and UVB rays from reaching the skin. Older sunblocks were white, pasty, and unattractive, but current products use so-called microfine oxides, either zinc (Z-Cote) or titanium. They are transparent and nearly as protective as the older types. Organic formulas and inorganic microfine oxides do not protect against visible light, which is a problem for people who have light-sensitive skin conditions, including actinic prurigo, porphyria, and chronic actinic dermatitis.Calculating SPFSPF is a ratio based on the amount of UVB radiation needed to turn sunscreen- or sunblock-treated skin red compared to non-treated skin. For instance, people who sunburn in 5 minutes and who want to stay in the sun for 150 minutes might use an SPF 30 sunscreen. The formula would be: 30 (the SPF number) times 5 (minutes to burn) = 150 minutes in the sun. SPF is not measuring protection against UVA. Warning: A wide range of herbal products may contribute to skin problems. Some Chinese herbal creams have been found to contain corticosteroids. Mercury or arsenic contaminants have been found in some ayurvedic therapies. In addition, several oral herbal remedies used for medical or emotional conditions may produce photosensitivity (irritation in reaction to sunlight). They include, but are not limited to, St. John wort, kava, and yohimbe. Asymmetry (A). Skin cancers often grow in an irregular, uneven (asymmetric) way. That means one half of the abnormal skin area is different than the other half. Border (B). Moles with jagged or blurry edges may signal that the cancer is growing and spreading. Color (C). One of the earliest signs of melanoma may be the appearance of various colors in the mole. Because melanomas begin in pigment-forming cells, they are often multicolored lesions of tan, dark brown, or black, reflecting the production of melanin pigment at different depths in the skin. Occasionally, lesions are flesh colored or surrounded by redness or lighter areas. Pink or red areas may result from inflammation of blood vessels in the skin. Blue areas reflect pigment in the deeper layers of the skin. White areas can arise from dead cancerous tissue. Diameter (D). A diameter of 6 millimeters or larger (about the size of a pencil eraser) is worrisome. Researchers are finding that moles greater than 6 millimeters are more likely to be melanoma. Larger moles correlate to a more invasive cancer. By the time a lesion has grown this large, there will most likely be other abnormalities. A doctor should examine any suspicious lesion, no matter what its size. Evolution (E). A lesion that has changed in size, color, or appearance should be examined. This is the most important factor, as any change should be evaluated. Shave biopsy uses a thin surgical blade, or scalpel, to shave off the top layers of skin. This is the most common type of biopsy used to diagnose skin cancer. Punch biopsy uses a round, cookie-cutter-like tool. It is used to take a deeper sample of the skin. This technique shows deeper levels of skin but is often not as wide as a shave biopsy. Incisional and excisional biopsies remove tumors that have grown deep into the skin. An incisional biopsy cuts out part of the tumor. 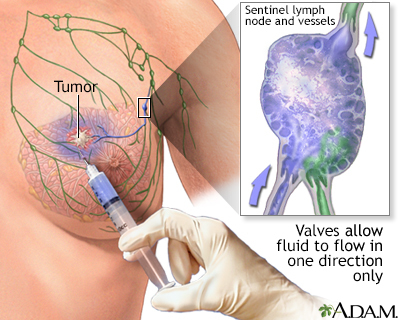 An excisional biopsy removes the entire tumor. These biopsies are used to diagnose melanoma. Severe drops in white blood cells (neutropenia). Certain chemotherapy drugs, such as taxanes, pose a higher risk for this side effect. White blood cell count may be improved by adding a drug called granulocyte colony-stimulating factor (either filgrastim or lenograstim).